Two of the most persistent myths about Churchill’s personal life are that he suffered from manic depression (Bipolar Disorder) or major depression, and that he was an abuser of alcohol. Google “Churchill and Depression” or “Churchill and Alcohol” and page after page after page will pop up. Both myths suffer from similar faults. Persons qualified to diagnose manic depression or alcohol abuse usually have a superficial knowledge of Churchill, while those knowledgeable about Churchill usually have a superficial understanding of mental illness or alcoholism. The depression fable has been capably addressed by Carol Breckenridge. A similar approach may be made to the subject of Churchill and alcohol—a subject on which we heard even more of than his alleged mental illness. “Not if you drink in moderation,” Cockran said. (1) 3-4 weak (no more than an ounce) whisky and sodas at 11am, teatime and bedtime and occasionally one other during the evening (He never drank whisky neat). (2) An imperial pint (20 oz.) of champagne or wine at a 1pm lunch followed by a brandy, also likely an ounce. (3) An imperial pint of champagne or wine at dinner followed by a brandy. This translates into approximately six glasses (1½ 750 ml. bottles) of champagne or wine daily along with 5 to 6 ounces of whisky or brandy spread over a 12 to 15 hour period. By any standards, that’s a lot of alcohol. A person’s body will process and metabolize pure alcohol at the rate of one ounce per hour, however, so Churchill’s regular daily consumption is within that rate. Were there occasions when Churchill drank more? Undoubtedly. But the amount of alcohol a person consumes does not define an alcoholic. What matters is the effect of the alcohol on a person’s health and life. 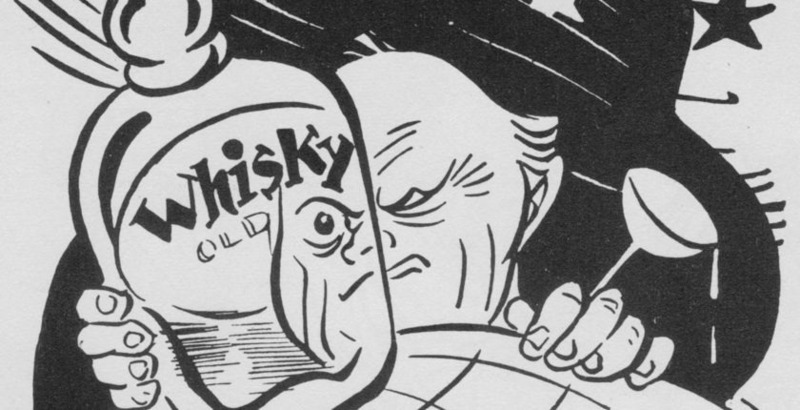 Labeling Churchill an alcoholic based on the amount he consumed is no more accurate than calling him Bi-Polar or manic-depressive because, like most people, he was from time to time depressed. He lost elections, lost cabinet offices, lost battles, lost political arguments. “The things he went through would depress anybody,” his daughter Mary often said. Let us begin with a basic dictionary definition of alcoholism before we consider the more detailed criteria in Diagnostic and Statistical Manual of Mental Disorders IV (hereafter DSM-IV) of the American Psychiatric Association (1994), and whether it relates to Churchill. The American Heritage Dictionary defines alcoholism as a “disorder characterized by the excessive consumption of and dependence on alcoholic beverages, leading to physical and psychological harm and impaired social and vocational functioning [emphasis added]. This definition alone establishes that Churchill could not possibly be an alcoholic. Where is the evidence of his impaired social and vocational functioning? During his life, he wrote over fifty books in eighty volumes. He produced over 500 oil paintings after the age of forty, played polo until he was fifty, rode horses into his seventies. He was the highest paid journalist in the world during his “Wilderness Years” of 1929-39, he eventually won the Nobel Prize for Literature. In a political career spanning sixty years, he held every major Cabinet position except Foreign Secretary (where he assumed its duties and served as acting Foreign Secretary while Anthony Eden was on medical leave). Along the way in 1940, when Britain and her Commonwealth stood alone, he saved Western Civilization. Clearly, using the a simple dictionary definition, Churchill was not an alcoholic. Let us however consider DSM-IV and similar, albeit more detailed and specific, criteria for a diagnosis of alcoholism. Like Bi-Polar Disorder, Substance Abuse and Substance Dependence (including alcohol and other drugs) are defined in DSM-IV as a “mental disorder.” Substance Abuse and Substance Dependence are two different things (abuse being a precondition for dependence, i.e., you have to abuse alcohol before becoming dependent on it). Churchill comes no closer to meeting these criteria than he comes to the dictionary definition. At no time within any twelve-month period in Churchill’s long and astonishingly productive life did his alcohol consumption manifest any of these criteria. His capacity for work—writing, painting, bricklaying, speaking, administering government departments—was legendary. Though he rarely drove automobiles himself, he had no “legal problems” associated with excessive use of alcohol. Any “persistent or recurrent social or interpersonal problems” he may have had were not alcohol-related, and usually political in origin. For example, when he held cabinet office, he would frequently annoy other cabinet members by intervening in or offering his opinions on matters outside his own jurisdiction. This, of course, was unrelated to his alcohol consumption. It was simply his nature. Since it is clear that Churchill never abused alcohol, he was never, by definition, dependent on alcohol in a clinical sense. Nevertheless, let us also consider the DSM criteria for dependence and apply them to Churchill. The substance use is continued despite knowledge of having a persistent or recurrent physical or psychological problem that is likely to have been caused or exacerbated by the substance (e.g., continued drinking despite recognition that an ulcer is made worse by alcohol consumption). Churchill does not meet any of these criteria, let alone “three (or more)…in the same 12-month period.” Churchill did not consume alcohol in order to “achieve intoxication.” Nor did he have “a need for markedly increased amounts” of alcohol. His consumption stayed virtually the same throughout his life. Hence, he did not consume alcohol “in larger amounts or over a longer period than was intended.” There is no evidence of his ever suffering withdrawal—let alone consuming alcohol to avoid the symptoms of withdrawal. He rarely made an effort to “cut down” his consumption of alcohol, though in 1936 he apparently won a bet with a friend who challenged him to abstain from spirits for a year. Of course he never spent any time, let alone “a great deal of time,” in obtaining alcohol, even in his youth, when he presumably had to order supplies himself. Nor did Churchill ever cancel “important social, occupational or recreational activities” because of alcohol. Only one of the DSM criteria may apply: it is possible that alcohol contributed to certain physical maladies as Churchill aged. Yet he was never treated for alcoholism, or told to stop drinking to improve his health. But none of this behavior on his part excuses historians or even serious writers to state flatly that Churchill was depressive or an alcoholic. He was neither. Those who say he was simply don’t know what they’re talking about. And if you don’t know what you’re talking about, it is a good policy to remain silent. Michael McMenamin is the co-author with Curt Zoller of Becoming Winston Churchill, the Untold Story of Young Winston and His American Mentor, and the author of several Churchill historical novels. For the past two decades he has written a column in Finest Hour entitled “Action This Day,” chronicling Churchill’s life at 25-year intervals.